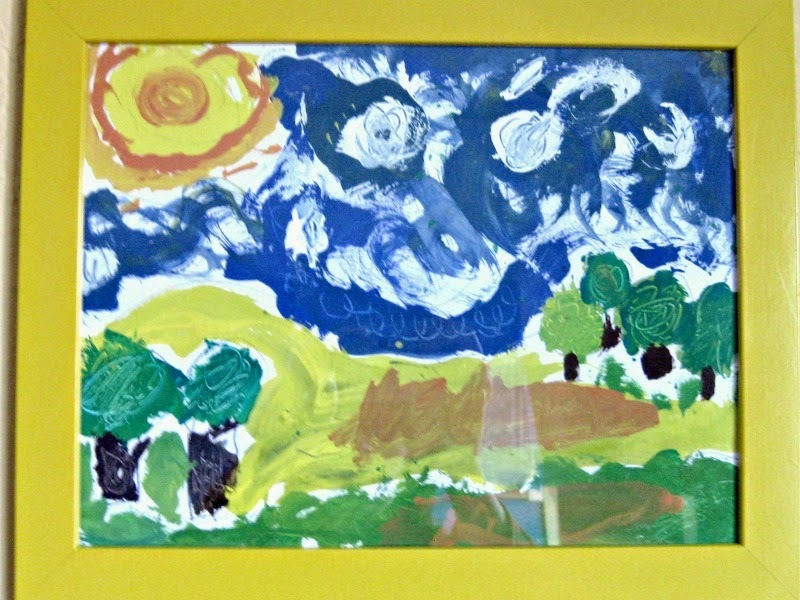 How to introduce great artists of the world to preschool children and help them create their first masterpiece. Not rushing it - we did it on a Saturday morning when both she and I felt rested, energetic and relaxed. Using good acrylic paints and thick cardstock paper helped Smarty to feel that this project is really special. Scaffolding - I sketched landscape features and painted division lines between colors, so she could remember which color will go where. I gave her many brushes, so she could paint different colors with different brushes. This helped to keep colors bright, since 4 year olds are not known for thorough rinsing and drying of their brushes. 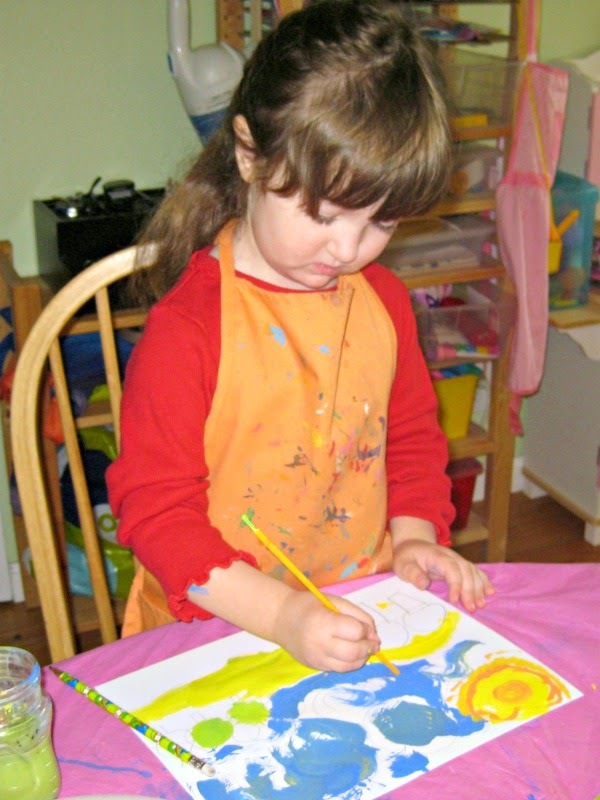 Focus on fun parts – like using a plastic fork and the other end of a paintbrush to make swirls in the paint. Quit while you are ahead. At some point I gently separated Smarty from her masterpiece before she could “improve” on it any further. Follow Natalie Planet Smarty Pants's board Learn About Great Artists on Pinterest. 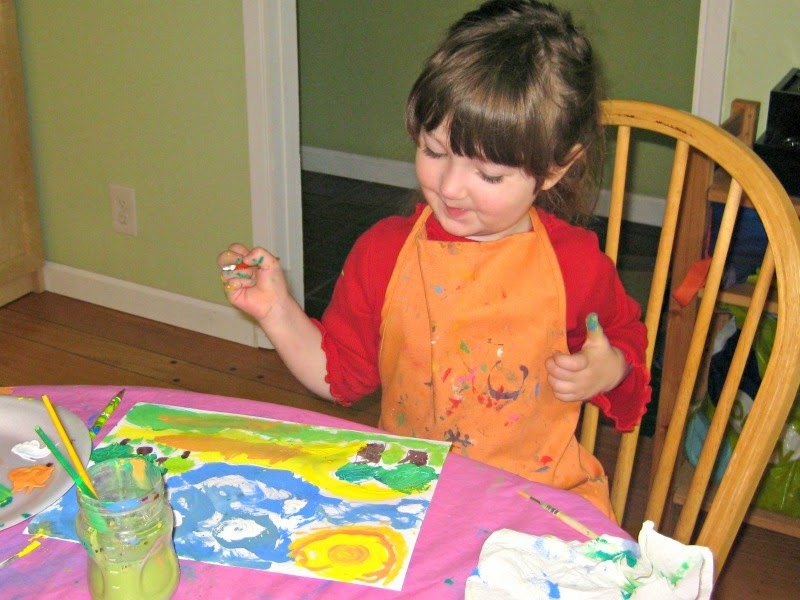 What are your tricks for guided art with preschoolers? Anna's painting looks fantastic! Your tips on making a successful art project are excellent, too. My kids always get excited about trying new, especially nice, art materials, and not rushing things (and displaying the finished product) is key! This is fantastic! She did a wonderful job. I love the way you presented it to her, set the supplies up and knew just when to say finished. I love Anna's art and the way you set this up. We own that book; it's fantastic! So cute! This is definitely a book we need to order. oooh, sounds like a great book! I love the painting! I just got that book and will be using it as our art curriculum! Anna's masterpiece came out great! I'm looking forward to seeing more of work! I love how you set it all up for he rto succeed. Dogs are not conducive to typing. Now I want that book. fabulous tips - thank you ! Okay, I take back my comment. I just did the activity with K on O'Keefe and didn't like it very much. No opportunity for creativity and I ended up doing most of it! Gorgeous picture! She should be pleased with her success - hopefully that will lead to more interest in painting! LOVE, LOVE, this post Natalie!! Anna's finished painting is beautiful!! Y'all did a wonderful job on it. I've wanted this book for ages. Now, after reading your post, I know I will purchase it. Our library does not have it. Again, this is super Natalie. I'm smiling big here:-). What a little artist! Beautiful job. Now all she needs is a beret! Yeah Anna! Her picture is great. It's so nice how you worked together and helped her succeed. Those are great tips. I wish that I could get to all the kids in Bear's class in time to get them to quit while they are ahead. Today, at least half of her class kept on painting over and over their flowers until there was not much of a flower left (we were doing the Georgia O'Keeffe project). At home, I usually encourage the Quit while you are ahead mantra! Anna's painting is definitely worthy of a frame. Ooooh a great set of tips! Painting with young children can be challenging, but I know from our experience that my son LOVES it when the final result is beautiful and he does like direction! Love your artwork, it turned out so well you must be both v proud! I have one question, are there any instructions/guidance for the projects? Thanks for the book recommendation too! Wow! She did an incredible job with this painting! I'm impressed! I get to pick up my book today--can't wait:-). Stopping from the Kid Blogger Hop!